Tip 1: The slower the crystal growth, the larger the size of the crystals. There are two ways you can slow the growth: by having a less concentrated solution, or by having the temperature decrease more slowly. If you pour your solution into a glass jar when it’s very hot, BE SURE TO TEMPER THE GLASS FIRST. Do this by adding just one spoonful of hot liquid and swirling it around the bottom of the jar. This heats the glass so it doesn’t break when you add the rest of the liquid. Hot water in the jar will cool more slowly than it would in the pot. The pot conducts heat very efficiently and the water is also more spread out and has a larger surface area. If you want to grow larger size crystals then you’ll either want to put the solution into the container when it’s still very hot, or reduce the amount of solute you use and wait longer for crystal growth. If, on the other hand, you want a smaller size of crystal, then you’ll want to let the solution cool down in the pot before adding it to the jar. 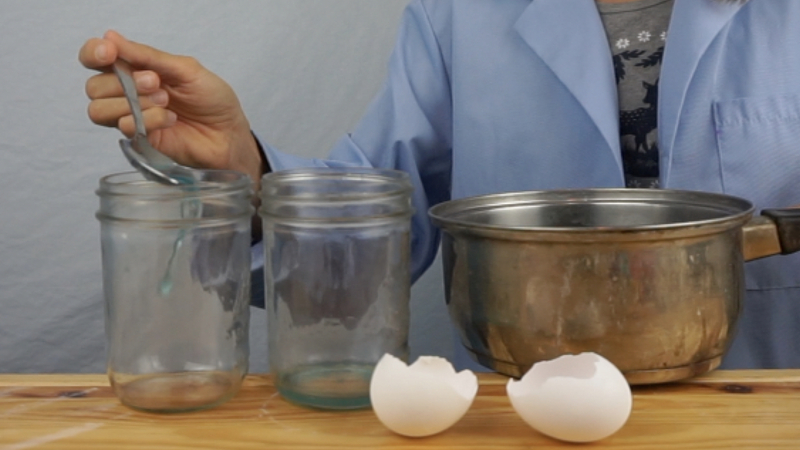 In the above picture, you can see eggshell geodes from six different jars. The green eggs on the far left were put into water that was luke-warm. It had cooled down almost to room temperature and you can see that the crystals are very small, almost like grains of sand. 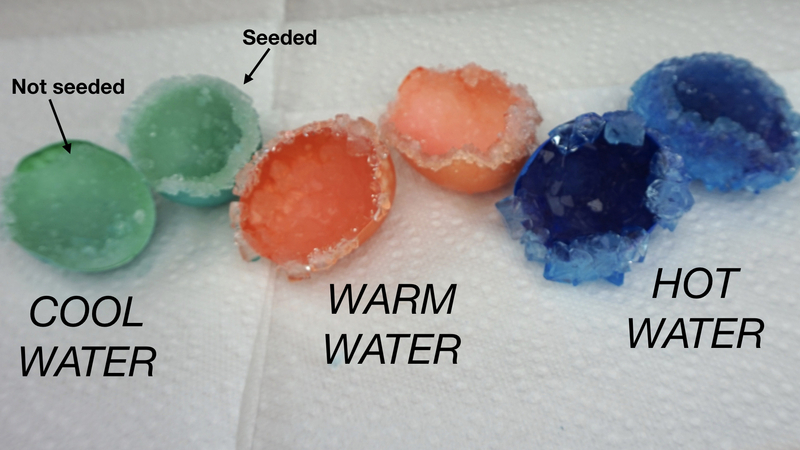 The eggs in the middle were placed into water that was still very warm, but not a temperature too hot to bathe in. Most of the crystals are the size of gravel and distinct from each other. And the blue eggs went into water that was nearly boiling. The alum solution had just come off the stove and after tempering the glass a bit, the hot liquid went straight into the jars and then the eggshells followed. All of the eggshells on the top row were seeded; I rubbed a little elmers glue onto the inside of the shell and sprinkled dry alum powder over them before putting them into the solution. The shells on the bottom row were not seeded. Tip 2: Use distilled water. If you live in an area with hard water, the dissolved calcium and magnesium ions that are already in solution will affect the crystal growth quite a bit. Even without hard water, distilled water helps you to get more of your solute to go into solution. Pick up a gallon of distilled water from the grocery store before you start. Tip 3: All of these crystals will dissolve again in water. That’s good news if you’d like to experiment and redo the projects again several times, because you can just boil up your crystals and reuse them. But if you’d like to keep them long term as an art project or decoration, be sure to coat them with a clear coating of nail polish. In theory, you should be able to place a seed crystal into a saturated solution of salt water and grow an even larger crystal. In practice, I was never able to get this one to work. 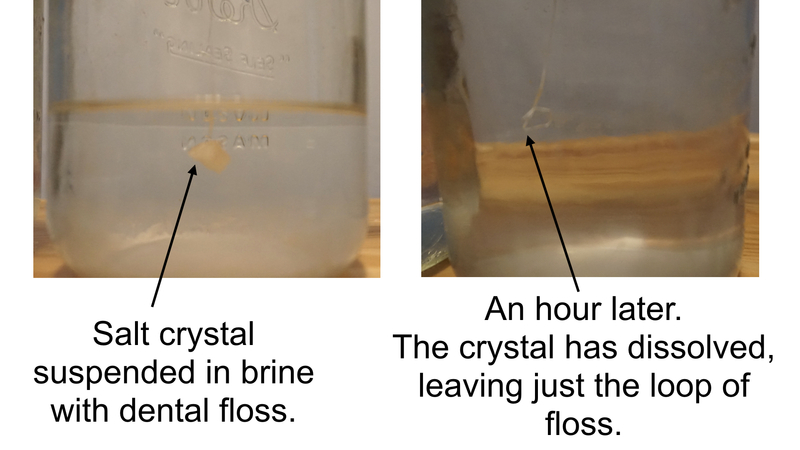 Each time I placed my seed crystal into solution, it dissolved, and I was left with an empty loop of floss or string like you see in the picture below. If you’re able to grow a large salt crystal, please leave a comment or send me a message. I’d love to see a picture! But for salt crystals all clumped together in a jar? These are easy. Just let salt water sit in a jar and wait. And wait. It requires a good amount of time, up to a month or more if you have a less concentrated solution. 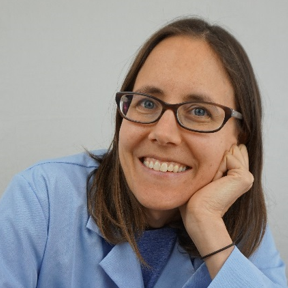 When you make your halocline, be sure that the top layer of water doesn’t splash into the salt water too much. If you create currents or stick a spoon into the jar and mix it, then of course the salt and fresh water will mix and the halocline will disappear. But if you pour the fresh water in slowly and let the stream of water land on a spoon before it touches the salt water, then it should work. After several hours, the salt water loses it’s cloudy appearance and it almost looks like a magic trick to see this egg hovering in the middle of the jar. The halocline layer is very stable. The eggs in the above picture had been sitting in the same positions (bottom, middle, top) for two weeks. With the eggshells in the picture under tip 1, it looked like seeding did help to promote more uniform crystal growth. But in subsequent batches, I didn’t get very consistent results. Take the crystal below, for example, which had been seeded with alum and then placed in very hot water and grew crystals on only a few locations. With hot water especially (which perhaps melts off the glue anyway?) I concluded that the texture of the eggshells plays an even bigger role than seeding. I think scratching the inside of the shell lightly would probably do just as much to promote crystal formation inside the shell as seeding it with dry alum. Note: the alum doesn’t incorporate much food coloring into its crystal structure, so if you want to see a tint of color to the crystals, you’ll want to add a lot of food coloring (think 20 plus drops). Most of the coloring will end up on the eggshell. Borax are good reliable crystals that grow quite easily. No need to seed your pipe cleaner in advance. The texture is rough enough that the crystals will grow all over it. 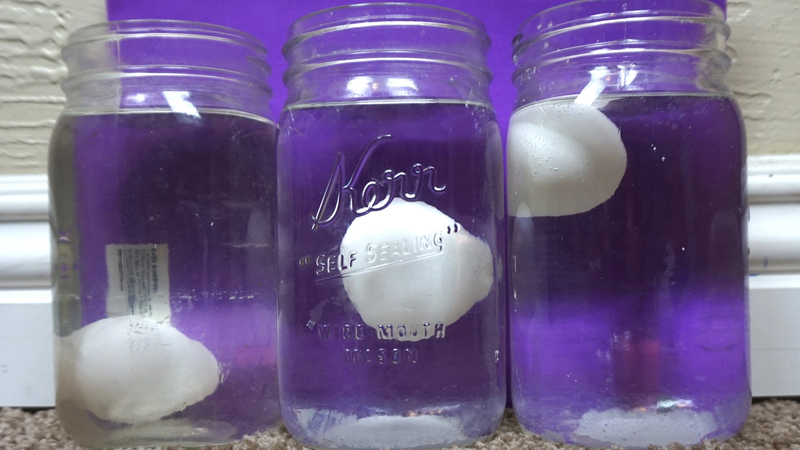 Bring to boil to dissolve the borax and pour into jar. Again, letting the solution cool in the pot first will produce a finer texture to the crystals, and putting it in hot will give you blockier and larger crystals. 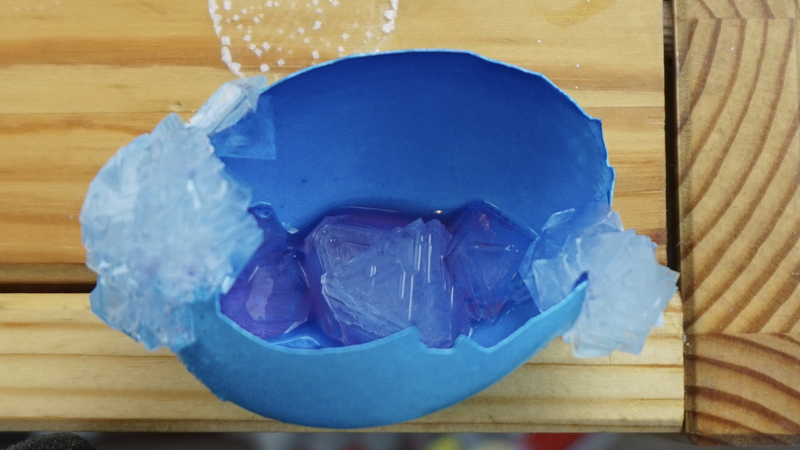 Use a lot of food coloring if you want to see a tint of color to the crystals (or for color you can rely on the colored pipe cleaner that you’ll be able to see through the crystals). If you want to grow rock candy as quickly as possible, you can use the fully saturated 8 cups of water to 2 cups of sugar. But this will crystalize very quickly (within a few hours), and if you leave it too long, you won’t be able to get it out of the jar. The ratio of 7 cups of sugar into 2 cups of water will usually be done by the end of one day, but 6 cups seems to be the right balance to me. It has the benefit of being able to see visible progress but progresses slowly enough that you’re not being in danger of having the crystals get away from you and get stuck to the jar. And, like you saw in the short video above, making sugar gemstones is, in my opinion, and even better way to experiment with sugar crystals. This one does require some patience, because large size crystals take several weeks to grow. Citric acid and epsom salts can be found in some grocery stores, but it’s probably easiest (as with the alum) to order them online. Mix the dry ingredients and wet ingredients in separate bowls. For the tablespoon of oil I recommend using whatever unsaturated cooking oil you have on hand (canola, olive, vegetable). If you’d like to purchase a nicer cosmetic oil (such as jojoba oil or castor oil), that’s a perfectly good option too. That about covers it! If you’d like to preview the little foldable book that accompanies this guide, you can do so by scrolling through the pages in the viewer below. To print your own copy, just select your preferred size of paper: 8½ × 11, 11 × 17, A3 or A4. Don’t forget to print “Actual size.” Do not print “Fit to page” or the book won’t come out right. To fold the book, either print the two-page document double sided, cut along the dotted lines, and then match the letters, or follow the instructions in this video: How to Fold A Book from One Piece of Paper.